WINDHAM—The Scots dropped in on the Eagles for a pair of summer-ball matchups on Monday, July 9, and the teams split the evening: Windham took the first bout 2-0 on runs by Bryce Afthim and Chris Naylor, while Bonny Eagle claimed a big, 11-2 W in the second bout, kicking things off with a fat first ups and never looking back. The teams consist of boys who’ll be in high school come next spring, either as sophomores, juniors or seniors, or as incoming freshman. 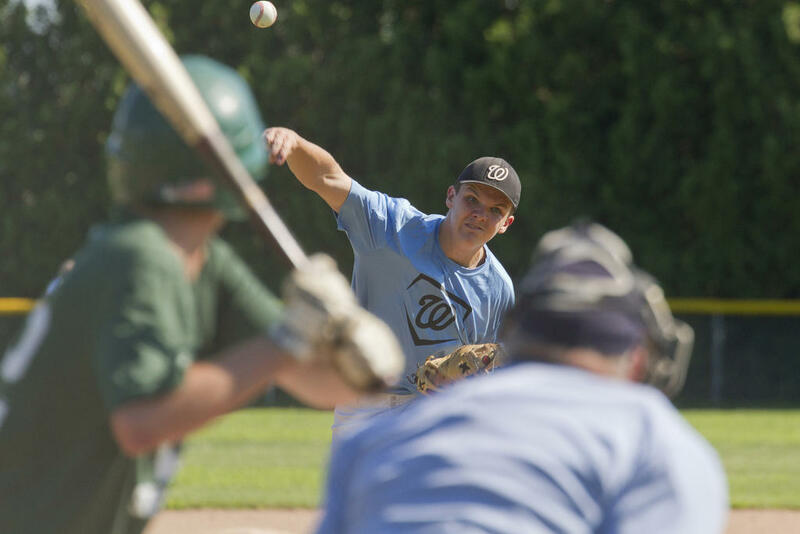 the League – the Regency Mortgage Summer League – is a low-cost, low-stress, convenient opportunity for athletes from this part of the State to log extra innings. The first game of the day – the one that’ll count, standings-wise – kicked off with a one-two-three top of the first, Naylor, the Windham starting pitcher, closing the stretch with a K against Cam Phinny. The Scots matched the Eagles defensively in the bottom of the first, turning in a one-two-three effort themselves, Bonny Eagle starter Jackson Bean K-ed the first two hitters he faced, Brady Afthim and Caleb McCartney, then lured Bryce Afthim into a line-out to second baseman Jake Humphrey. In the second, Bonny Eagle remained quiet while Windham spoke up. Naylor reached base on a single grounder into left, advanced 90 feet on a Ryan Sargent single grounder up the middle, advanced again on a Nate Plummer sac grounder and reached home on a wild Bean pitch. The Scots, in fact, remained quiet through the entirety of the outing, allowing Windham to achieve their eventual winning result. 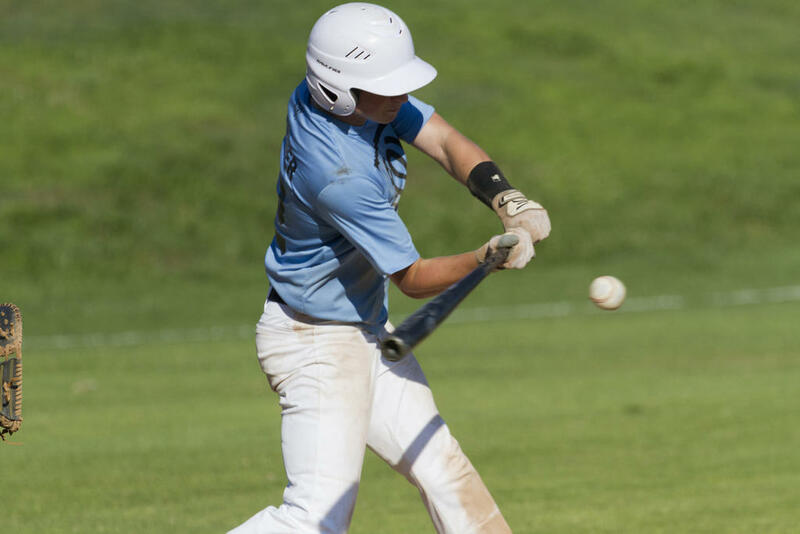 The Eagles scored a second run in the fourth, when Bryce Afthim singled to reach base, advanced on Naylor contact, reached third when Bean hit Sargent with a pitch, and scurried home when Plummer flied out to center. Impressively, Bonny Eagle centerfielder Will Whyte’s throw home – which required no cutoff man – nearly made it to catcher Bailey Walker in time for Walker to tag Afthim out at the plate. “Nearly” doesn’t cut it, of course, but still…spectacular attempt. Humphrey, Whyte, Ethan Hamilton, Khyler Hart, Logan Fogg and Corey Labrecque added one hit apiece for the Scots in the loss, Whyte’s a double to deep right-center in the top of the second. The second game of the day won’t factor into the standings, as it was intended to afford some greener players more field time. 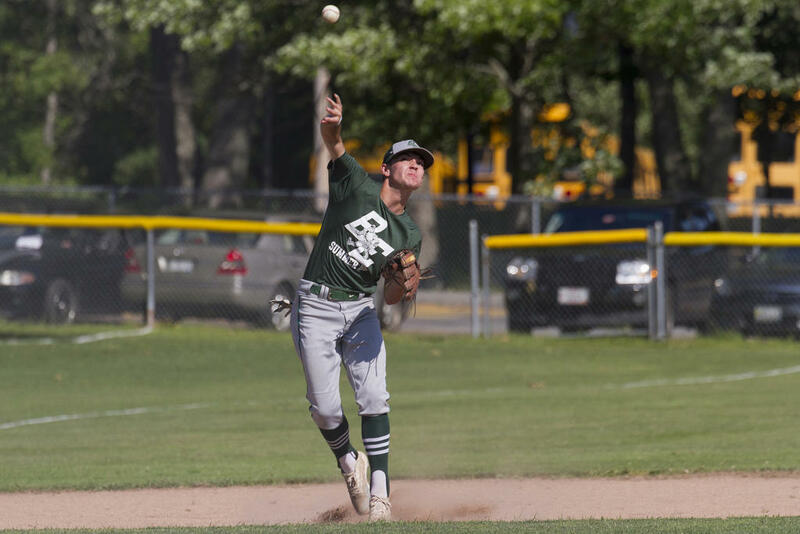 Bonny Eagle kicked off the top of the first with standout pitching from Hart, who struck out three of the five Windham batters he faced, walking one other and giving up a single that didn’t matter in the end anyway. Then, in the bottom of the first, in the Scots’ initial ups, they struck it rich: Hart, Humphrey, Josh Chadbourne and Nate Morse all scored, Chadbourne on a Labrecque double drive into left, Morse and Hart on a Humphrey single drive into shallow center and Humphrey on a Reegan Thomas grounder single past second base. Bonny Eagle cruised from there. 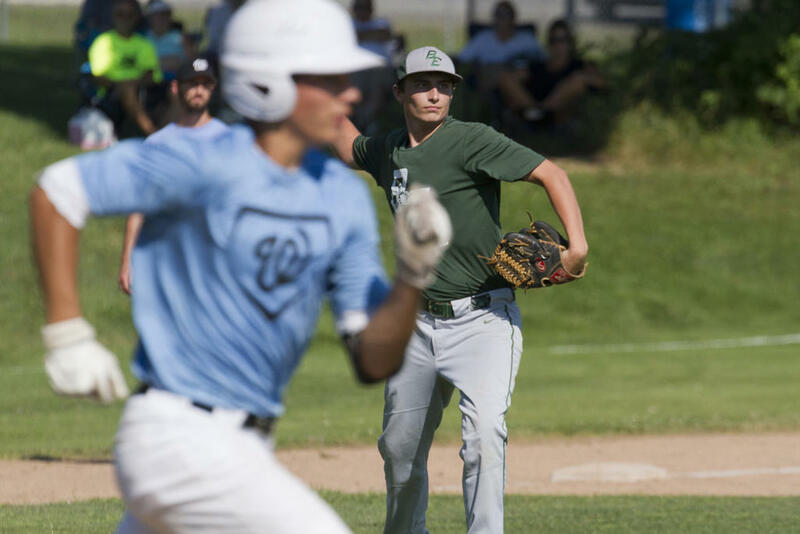 For one, Hart continued to look sharp on the mound, coaxing three consecutive batters into routine groundouts – to short (Humphrey) , third (Morse) and second (Chadbourne) – in the top of the second. Beyond that, the Scots to dig up plenty of further hits and runs in the batter’s box. They added three in the fourth – Labrecque, Ayden Smith and Shaun Brilliant all tallied – as well as five more in the sixth (Brilliant, Chadbourne, Labrecque, Cam Phinney and Hart). For their part, Windham picked up just two points in the battle: Bryce Afthim scored on a Dylan Plummer shot in the third, and Plummer scored on a fielder’s choice to second in the sixth. 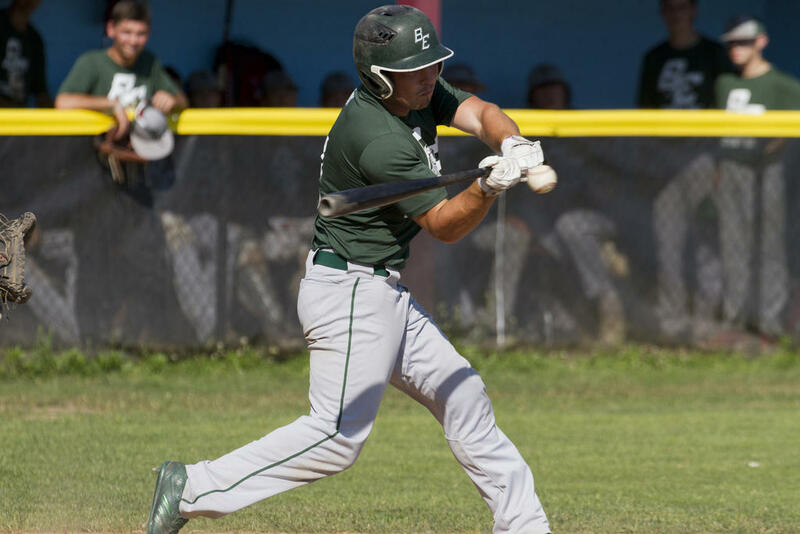 Humphrey went 3-4 for the Scots, which tally includes a late-game triple. Labrecque also went 3-4, notching a trio of singles. Brilliant went 2-3, Cam Phinney 2-4, Smith 1-3, and Chadbourne, Morse, Hart and Thomas 1-4. McCartney, Naylor, Sargent and Plummer added singles for the Eagles. Notably, all the Regency League games features wooden bats, a bit of a novelty at this age level and a fun learning tool. Corey Labrecque jumps off second for the Scots in their second game vs. Windham on Monday. 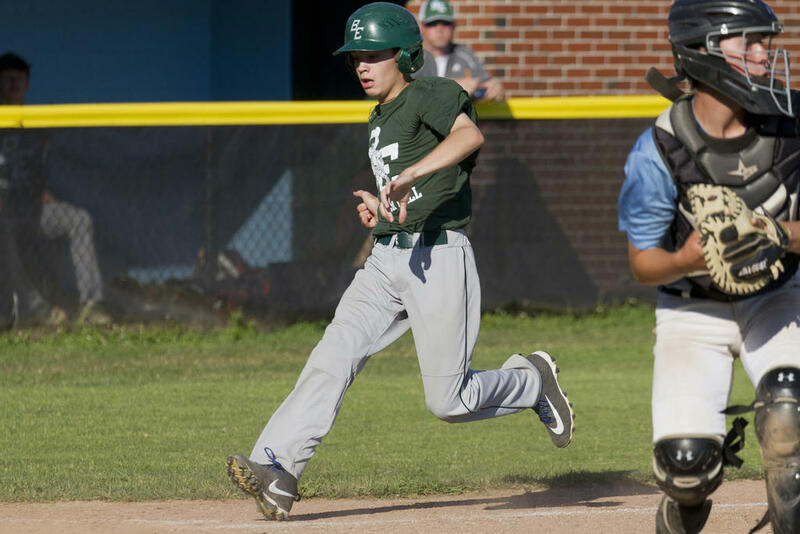 Josh Chadbourne arrives home for BE in their second game vs. Windham on Monday – an 11-2 rout. Nate Plummer takes a cut for Windham in their second game, a loss, vs. Bonny Eagle on Monday. 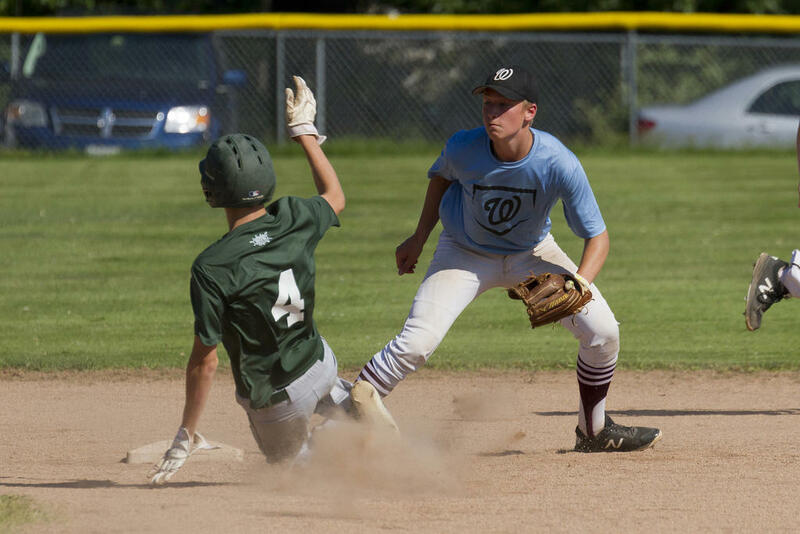 Bonny Eagler Jake Humphrey gets caught stealing; Windhamite Cole Warnburg reaches out to grab the incoming throw. BE SS Ethan Hamilton fires toward first. Will Whyte connects with the ball for BE. 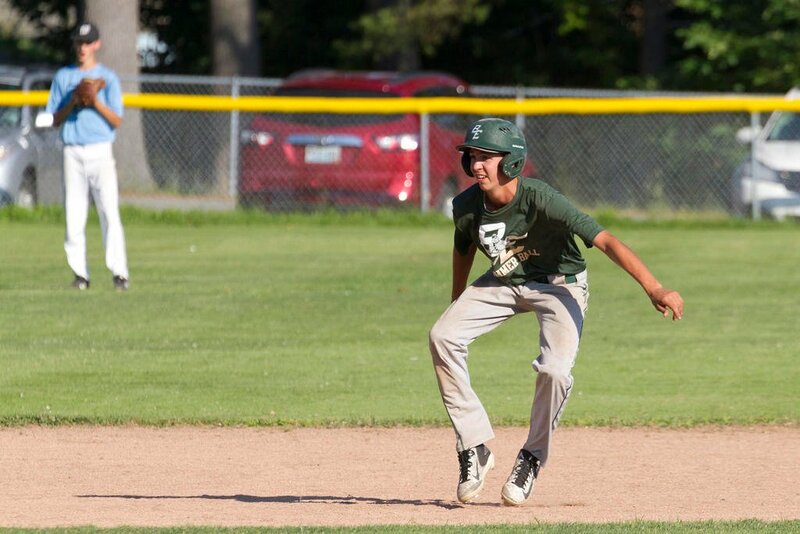 Bonny Eagle starting pitcher Jackson Bean grabs a short grounder and wheels to fire it toward first; in the foreground, Windham runner Bryce Afthim races for the bag. 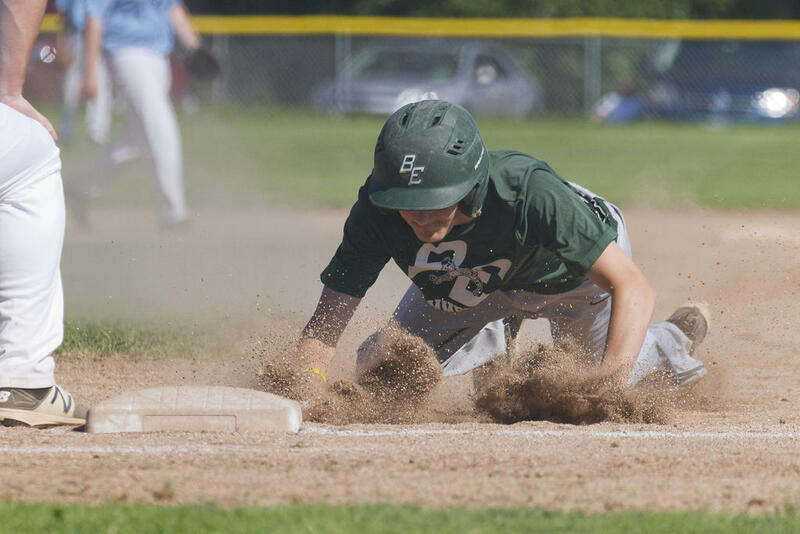 Bonny Eagler Logan Fogg steals second, as Windham baseman Cole Warnburg covers, waiting on a throw that won’t arrive until too late. 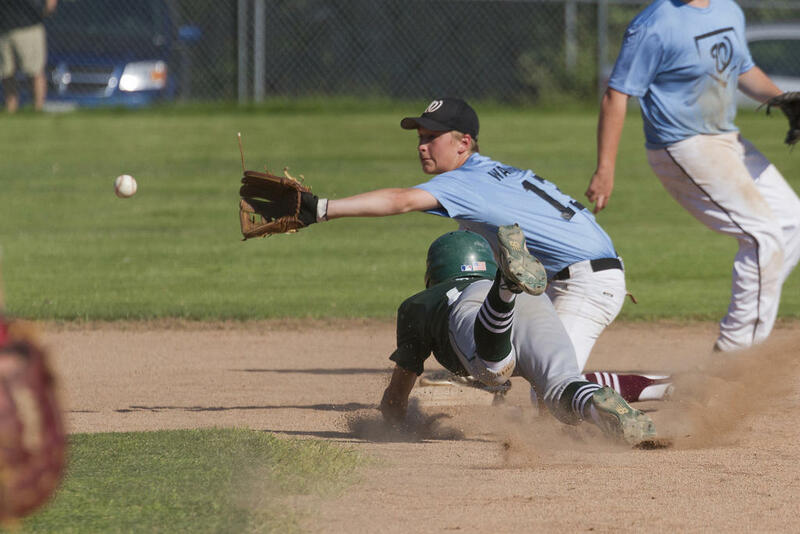 Logan Fogg dives back to first for the Scots in their 2-0 loss to Windham. 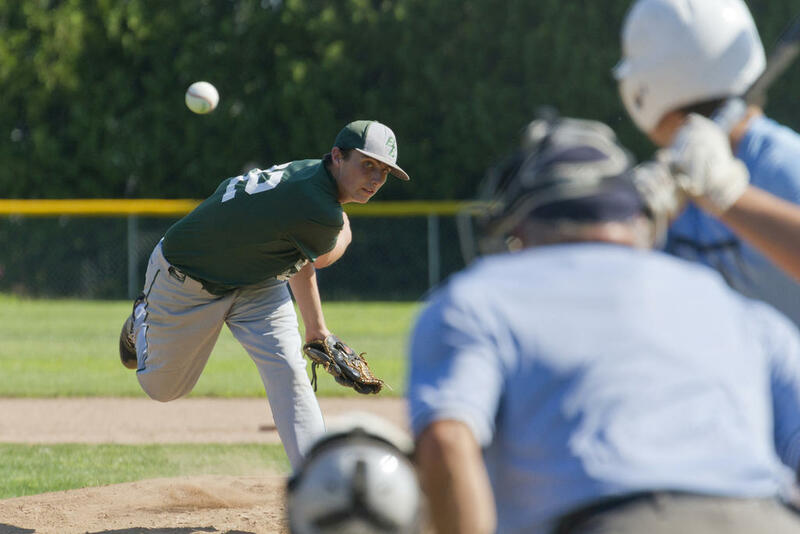 Jackson Bean fires from the mound for Bonny Eagle in their loss to Windham. Windhamite Chris Naylor unwinds into a pitch in his team’s 2-0 win over Bonny Eagle on Monday. 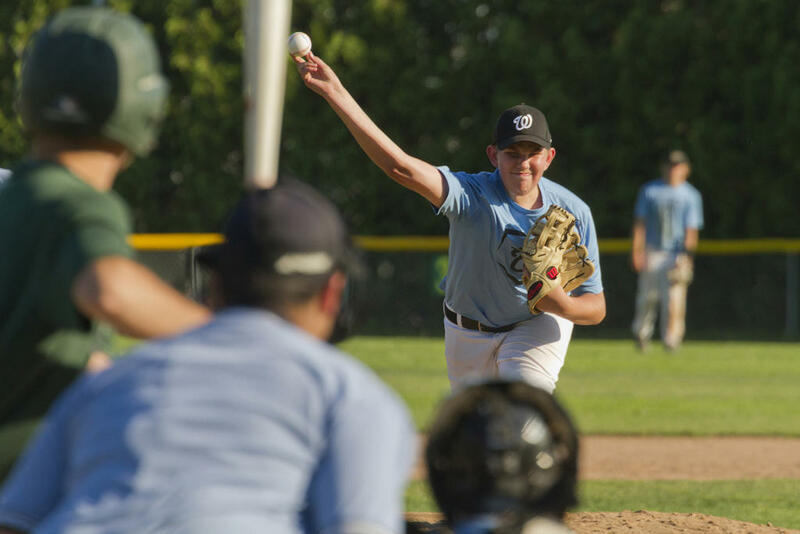 Cam Joyce took to the mound for Windham in their second game on Monday.